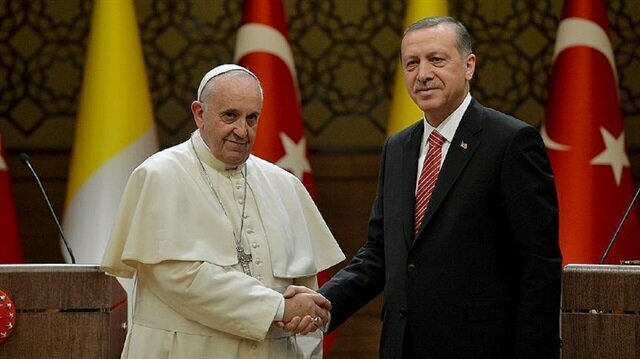 Turkey’s President Recep Tayyip Erdoğan will go to the Vatican on Feb. 5 on the invitation of Pope Francis. The main item on their agenda is expected to be the Jerusalem issue. Erdoğan’s visit will be the first presidential visit to the Vatican in 59 years. Pope Francis has already paid an official visit to Turkey on Nov. 28, 2014 and was the first leader to be hosted at the Turkish Presidential Complex in Ankara. President Erdoğan will extend his gratitude to Pope Francis for his stance on the matter of Jerusalem, who was one of the leaders whom Erdoğan contacted via telephone when U.S. President Donald Trump declared Jerusalem as Israel’s capital on Dec.6, saying that he would move the Tel Aviv embassy to the holy city. Erdoğan will also underline the significance of conducting joint efforts for the preservation of the status of Jerusalem. President Erdoğan will also point out that for the establishment of peace and stability in the region, an independent and sovereign Palestinian state, with East Jerusalem as its capital, should be founded based on the borders of 1967. He will highlight that Pope Francis’s support is significant in the upcoming process regarding Jerusalem. Jerusalem is sacred to both Muslims and Jews, as it includes sites known to Muslims as Haram al-Sharif (The Noble Sanctuary), al-Aqsa Mosque and the Dome of the rock, as well as an ancient Jewish temple. Recent developments about the refugee problem in Syria and Iraq will also be on the agenda. Following his visit to the Vatican, Erdoğan will also pay official visits to South American countries, including Venezuela, Brazil and Paraguay. President Erdoğan’s visit to South America will address regional and global issues, mainly the situations of Jerusalem, Syria and Iraq, in addition to economic relations with South American countries.